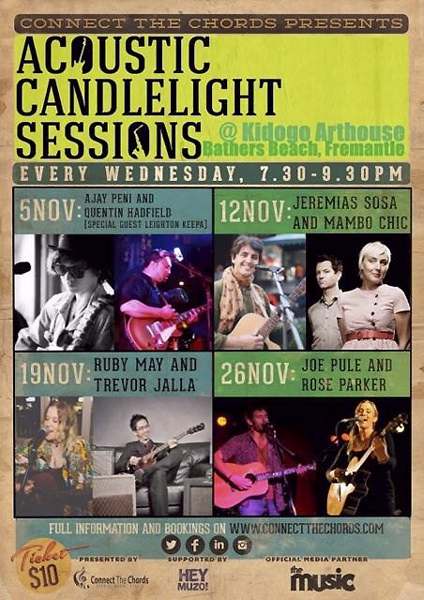 The ACOUSTIC CANDLELIGHT music sessions are on at Kidogo Arthouse on Fremantle Bathers Beach on Wednesdays from 7.30-9.30 pm. This Wednesday, November 12 Argentinian singer songwriter Jerimas Sosa will delight you, followed by the groovy beat and French lyrics of Mambo Chic. Tickets are only $ 10, so have a good night out and relax at the Indian Ocean.